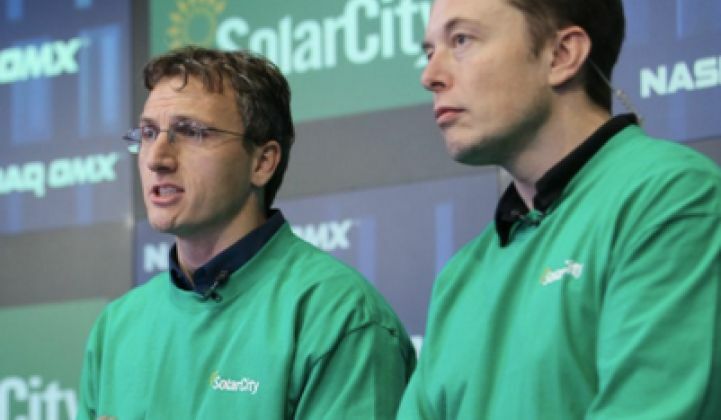 Tesla CEO Elon Musk, SolarCity CEO Lyndon Rive and CPUC President Michael Peevey appeared together onstage at the packed California Public Utilities Commission Auditorium to discuss "Innovation and the Impact of Regulation." Peevey led off by noting that his regulatory preference is "light-handed" and that regulation can act as a damper -- or as an "incentive and inspiration to innovation." As an example, he cited "loading order" as a simple innovation instituted on his watch that prioritized energy efficiency and renewables. Musk saw the necessity of regulation in cases where the free market can't operate, such as the natural monopoly of a wire-operating electric utility. In the case of sustainable energy, "The right thing would not happen without the regulators," said Musk, adding that it is "difficult to resist the pressure of incumbent companies." Rive formally announced that he had developed "a deep appreciation for the importance of regulation." He added, "Regulation has to address market failure, and climate change is a market failure." Rive praised California's Million Solar Roofs program, stating that it helped put the entire U.S. solar market "on the map" with "California leading the space." Combine innovation with an end goal like "decarbonizing" the energy infrastructure, said Rive, and "allow innovation to occur to fix the problem." He also noted that his young distributed energy company will likely hire its 5,000th employee next Monday. Musk hinted at the recently announced Giga factory when he asked the audience to consider a factory that simply relied on massive economies of scale to procure the nickel, cobalt and aluminum required to make the battery cell. With that, Musk claimed the ability to get to well below $100 per kilowatt-hour using the current lithium-ion formulation and technology (although higher-performance cells are in the works). Peevey said, "I think we enabled storage," characterizing CPUC's recently enacted 1,300-megawatt storage mandate as "a perfect example of stimulating a new market." Rive said that "innovation must not be constrained" and gave an example: customer interconnect for SolarCity's energy storage system takes an average of eight months, according to the CEO. And "hundreds" of SGIP program customers cannot connect, according to Rive. Musk's reaction to news of this lengthy connection delay: "That's crazy." Peavey was familiar with the utility industry's tendency toward delays, but said to take some comfort that "after today -- that wait will come down." Lyndon Rive sees the next generation of challenges happening in the coming five to eight years and spoke of the necessity for utilities to "get on board" to create a collaborative business model. Musk did give a positive review of the new Lego movie. But then he concluded, "If we don't have sustainable energy -- we're screwed."